It’s been seven years and 20 shows to bring Rebellion Muay Thai to the international standard we see today.This past weekend in Melbourne Australia, long time fight promoter Sy Nadji held Rebellion 20. The event featured two Thai fighters from the renowned Fairtex Training Center, and achieved a long time goal of promoting his first ever Rebellion Title fight. Since his first show in 2011, Sy has promoted a total of 32 Muay Thai events. He’s brought over Thais from powerhouse gyms Sitsongpeenong, Sitmonchai, and regularly from Fairtex. He now offers a pay-for-view live stream online via his own website, and recently launched a partnership with Ladbrokes to allow fight fans to place bets on all the action. Kompetchlek Fairtex was the first Thai fighter up for the night when he took on Australian David Pennimpede. Pennimpede, who recently captured the Australian WBC Title, is known for his lean long legs and outstanding kicking style. The last time he was on Rebellion, he stopped Luca Negreira with a savage elbow in round two. Kompetchlek Fairtex, on the other hand, is both a former WBC World Champion and Rajadamnern Stadium champion with well over 150 fights to his name. Training full time at Fairtex, he has access to not only some of the best sparring partners but knowledgeable strength and conditioning coaches as well. Nonetheless the Aussie was honoured for the experience to share the ring with a former Rajadamnern Stadium Champion. Pennimpede showed both heart and durability; he’s got a huge future in the sport. 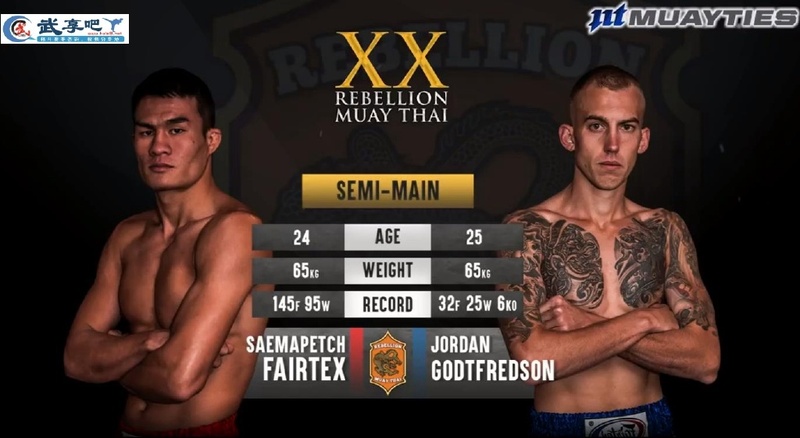 In the second fight, Saemapetch Fairtex took on Jordan Godtfredsen. Saemapetch is the current Lion Fight World Champion, and has previously won the prestigious Boon Seua tournament at Channel 7. Despite having seen Saemapetch wreak havoc on previous shows in Australia, Godtfredsen was very eager to accept the challenge. “He will never say no to a fight,” Sy told TFN. The fight started off slow but picked up in later rounds. While it remained competitive, Godtfredsen had no answer for Saemapetch’s perfectly placed left body kicks. Despite the relative one-sidedness of both fights, the willingness of the Australians to take on high level Thais still in their prime will pay off tenfold in the future. In the main event homebred hero Toby ‘The Weapon’ Smith rematched Slovakian Jakub Benko for the super-middleweight title. The pair last went to war at Rebellion 15 with Smith edging out the decision. This time however, nothing would be left to the judges. Smith stopped his rival with a beautiful left hook in round two sending the Benko to the canvas. He made the count, but was subsequently dropped. It was recently announced that and exclusive agreement has been made for Smith to return and defend his belt in Melbourne. There are already a couple of very good international contenders lined up for the challenge. Promoter Sy Nadji is raising a great group of ambassadors for the sport in his home of Australia. He brought on the legendary Jonh Way Parr and Dane Beauchamp as commentators. The pair are very knowledgeable and truly understand nuances of Muay Thai. His willingness to bring over high level Thai fighters and let them fight five full rounds of Muay Thai is a testament to his passion and commitment to both his promotion and sport.